Faeries are depicted in many colors, but do they dream in color or in black and white? In the daytime, or at night? Explore the possibilities with this crochet ensemble, and bring your faerie dreams to life in hues of your choice. Double tiers of crochet lace make up the zip scarf, which flutters softly about the neck and shoulders to echo the hem of the dress. The ruffle pattern is also a unique highlight for the everyday wardrobe, and can easily be adapted into an edging for everything from sleeves to boot cuffs! The crocheted hat shades dreaming eyes perfectly, and is worked in the round with picots for textural interest. If desired, lace a ribbon through the contrasting band. 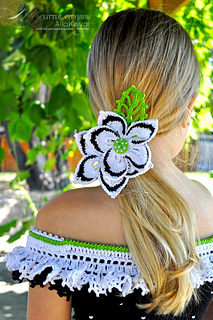 Wear it unadorned or with the Wildflower Crocheted Pin, which features layers of petals fanning outward in pleasing asymmetry, balanced by a leaf in silhouette. The pin can also be worn separately as an accessory for hair or dress! 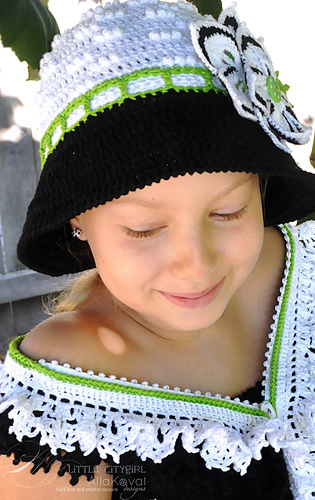 Yarn: Omega Perle #5 (100% cotton/50 g (1.75 oz)/178 yd): #501 white - 3 (3, 4) balls, #502 black - 2 (3, 4) balls, #529 lime green – 1 ball.